Electrical equipment failure is almost always accompanied by increased heat due to an increase in resistance. 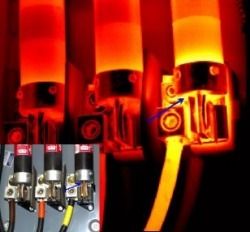 ThermoView's scanning process can identify hot spots, enabling corrective action and the prevention of costly downtime resulting from an electrical failure. a fully documented report containing infrared images of potential problems. Recommended action to correct detected anomalies is also included in the report. Delta Infrared employs certified Level 1 technicians that are trained in capturing and interpreting infrared images.